After almost four years Germany's Wicked Sensation return with new album 'Adrenaline Rush'. Ian Johnson speaks with band leader Michael Klein about why it's taken so long for the band to complete their new album, why David Reece is singing for them and much more besides. The new album 'Adrenaline Rush' has taken almost four years to come out Michael, why is probably the most pertinent question...? Well basically it didn't actually take that long to make the album. What actually happened was that after our last album, 'Crystallized', came out, a lot of things happened to us on personal levels that weren't good things. There were issues for us as people and also illness caused a lot of the problems and made us cancel the production of the album at many different times. So it might have taken four years for the new album to come along but this was really only due to a lot setbacks. Happily it's finally here though and our nerves can finally now settle down. On the new album you've hooked up with Bangalore Choir's David Reece (now also the new Bonfire vocalist). How did that come about? That has a lot to do with the illness we spoke of. Robert (Soeterboek) our singer became sick after the last album. He was having a lot of vocal problems so he went back to Holland to see a throat surgeon who told him he had a cyst on his vocal chords that needed removing. So of course even though we had some recording session booked he couldn't sing like he used to. He went for the surgery and he's now on the long road to recovery. It was actually his idea to get another singer in the band to help out with the album, so I contacted David Reece and asked if he would like to help us out and he kindly said 'Yes, no problem", so that's why David's on this CD. He isn't however our full time singer, he's just helped us out and he's done a wonderful job. When Robert is better, and he's getting vocally stronger all the time, he will rejoin the band as our singer. David has, I think, given you a more American sound. Well yes, I see where you're coming from, although I always thought our sound was more American that European. I always thought that Robert, who is Dutch, had a more American sound to his voice than say a Dutch or European one. So I'm not sure if we sound more American than before but maybe we do. I might be too close to the music to make that call. The new songs have a very American Hard Rock sound to them. KISS meets Autograph meets Van Halen etc. Wow! That's not a bad thing to hear. 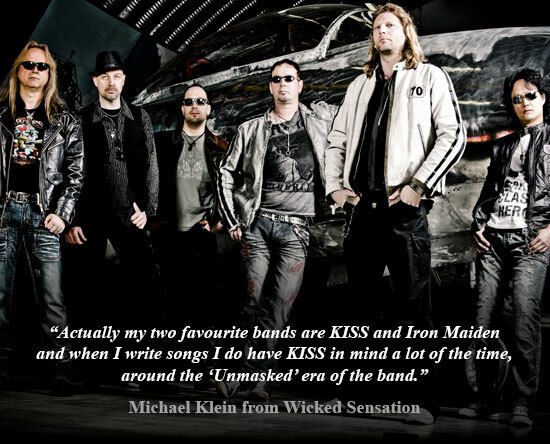 Actually my two favourite bands are KISS and Iron Maiden and when I write songs I do have KISS in mind a lot of the time, around the 'Unmasked' era of the band. I also write songs in a Maiden vein sometimes but that's not for Wicked Sensation. The songs though sound that way because that's how I write and even though David is American the songs weren't written with him in mind, they were actually written long before he joined us. Nearly all the songs were written with Robert, so he was always the vocal inspiration for the music, so I don't think that even if it was Robert on vocals that the songs would sound that different. Well Harry and Eric and I all worked on the First Signal album, which came out on Frontiers. I played all the guitars on that album and I, as a musician, like to get to play with other great musicians. So when Harry asked me to work on the First Signal album I said yes straight away. Then I thought why not ask Harry if he'd like to help with this new album; then I wanted some keyboards for the new songs and I immediately thought of Eric who is such a great musician. Mathias is a friend and he played the solo on the title track for us and did a great job. You and Sang Vong (guitarist) seem to have a great chemistry. It must be nice to play with a musician who knows just what you need as a player and who you can bounce ideas off. Absolutely. Sang is a very old friend and we've played together for over twenty years now. He played on the first two Wicked Sensation albums then left before the third one due to personal reasons. Now though he's back and I'm really happy to be able to work with him again. We understand each other's playing so well that we instinctively know what we're going to do which is a wonderful thing to have as a musician. Dennis Ward once again produces the album and he also played on the last one. So is he an un-official band member? Yes, definitely. I couldn't imagine anyone else producing Wicked Sensation. He's an old friend of mine and it's easy and comfortable to work with him. Also he lives about 20km away from my house so it's easy to just go over to his place and pester him about working together again. He's just the best and so professional to work with and he makes us sound so good. Will the band be touring in support of the new album? Actually no, not at the moment. David just helped us out with the recording aspect of the album and we want to wait for Robert to get better before we do any live dates, so no plans for tours with David. You see Robert's surgery went so well that he's looking at January to start light singing again and then we'll see how his voice is then. He'll hopefully be back in shape to go out later on next year for some festival dates and shows in Europe. Hopefully the UK too but it's not easy to get tours these days, so if any promoters are reading this we'd like to play in the UK, gigs or festivals. We're open to offers.